Below is my site search engine. Use it to see if I have material about a classic company or gear topic. Invention of Nylon in 1935, the key to Outdoor Gear Innovation! Link to Al Tabor's comprehensive, ever-growing site "Out In Under"
Please Note: All Material below, and in all my "History of Gear" webpages, is copyrighted, and no usage of my material is permitted unless explicit permission is granted by me, Bruce B. Johnson, owner of OregonPhotos.com. Much of my material has been derived from interviews and correspondence with various company founders and management, as well as "common" folk who have owned, used and cherished the gear..Gear Lovers: if you were involved with one of the old-line, vintage gear companies and have a story to tell in these pages, please contact me soon at oldgear@oregonphotos.com -- Sponsors: if your outdoor company is interested in sponsoring this site, please contact me for details (oldgear@oregonphotos.com).... Publishers: currently I publish via "POD" technology, which has freedoms but leads to books that are relatively expensive; thus, I seek a traditional publisher. Finally, please see below for Disclaimer (click here). What's the Big Picture, why did most of these great old companies vanish? Essay under development. Why Does Anyone Care About Old Gear? "Equipment is your Life. You have to be prepared to deal in extreme temperatures and extreme weather. Simplicity is important, be it packs or outerwear." I believe that many of the classic companies and their products represent a Better Way than the curses of modern consumerism that are presently ravaging our environment, and peoples worldwide, whether they be rich or poor. The best of the classic companies built products that were meant to last a lifetime, and often did. They used no overseas "off-shoring" that hurt their country's manufacturing base. They treated their employees like family in the truest sense of the word. They treated their customers personally and with great friendship and respect. The modern emphasis on Planned Obsolescence and Perceived Obsolescence* were unknown to them. Their adherence to keeping up with ever-changing "fashion" trends was minimal. They were not part of the "Fashion Industry." In a way, they represented a form of anti-consumerism, anti-consumption, and anti-capitalism.... I hope that my readers will come to appreciate and act on these kind of old-fashioned values through learning about these old classic gear companies. * these terms from Annie Leonard, "The Story of Stuff." -- A Swedish company with a US presence has a very strong dedication to these values, and states these very cogently on their page about their philosophy. And then there is an outdoor store in Portland, Oregon which has a large commitment to such values--- Click here for a link about "Next Adventure," which has an entire floor dedicated to the buying/selling/trading of used outdoor gear... Thank you.- Bruce Johnson, author of History of Gear website. Steve contrasts the material goods of his childhood with what we have now in the 21st. Century --- "[in the1960s] all the material goods that filled our summer houses or basements--old fishing poles, reels, leader boxes, wooden hand painted lures, lawn furniture, tools, lamps, etc. [items made}. from the 20's to the 60's, all had weight, substance, and a richness in their materials; Mostly wood and metal. Today, a child looking back on their lakeside summers ... will remember a partially deflated high color vinyl air mattress that probably provided service for less than a week, and a range of other plastic toys. Nothing worth saving. There are luxury brands that continue to produce beautifully made products today, but the products from the past that were affordable to the middle class or upper middle class were made with the kind of care and materials that only the luxury brands are imparting today. It seems that many of the consumables today have next to no residual value once purchased. I am resigned to hoping that at the very least our recycling programs can deal with all the junk." Subject: Why does anyone care about the old gear? 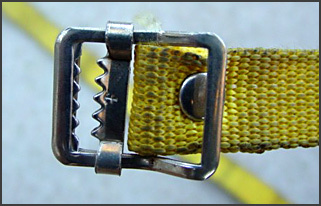 Above is an old-fashioned strap, the type popular during the 60's, 70's, and 80's. This one, I've had in my strap collection since about 1972. It still functions perfectly. As "J.K." asserts in his essay, it's truly a piece of "old gear" that was a near-perfect marriage of form and function, done in the new materials that had become available to backpackers during the Post- WW II period. Unfortunately, as the 1990s progressed, this elegant and perfect design was scrapped, replaced with plastic buckles of various designs. I tried them all; none worked nearly as well as my old trusty toothed buckles; a major flaw is how difficult it is with most of the plastic buckles to easily clamp down tight and be sure the buckle will hold, come thick or thin, as you crash through the brush. So my vote goes to this great classic strap design-- a hard nylon webbing of the proper width and thickness combined with a strong metal (not plastic) rivet, topped off with a simple, easily-operated, corrosion-resistant METAL buckle with teeth, and all nickel-plated! Long live Classic Gear! 1970 Cross-Country Ski Trip, lots of classic gear contrasted with a picture of a modern ultralight gear camp! I had heard repeatedly of the existence of a book about the History of Gear that was written by British (English) writers. I finally obtained a copy, actually the personal copy of Gerry Cunningham. I've been finding it to be refreshing-- quite a different look at the subject compared to what I've done in my own History of Gear Project. The book is named "Invisible on Everest- Innovation and the Gear Makers." It bills itself as covering a time period from 1850 to 1995. It had four corporate sponsors: Grivel, Karrimore, The North Face, and Trangia AB. As I read it, I was struck by the total absence of any interview material from the great American pioneers like Gerry Cunningham, the Lowe brothers, or George Marks and Bob Swanson. 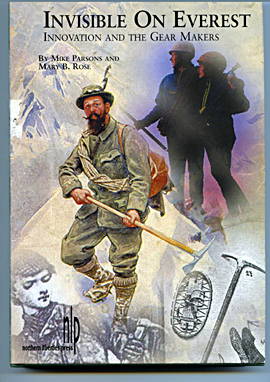 The book's perspective is wholly European, with a real focus on British history of gear and climbers. Don't buy it to find out more about American pioneers and companies, but do buy it to broaden your horizons considerably!